GOP Civil War has broken out on Fox News again. This time, it’s over immigration reform. In one corner, there was Lindsey Graham on Your World yesterday. Shortly before him (neatly placed so he was allowed the opportunity to rebut) was Michelle Malkin. Malkin, as usual, was in a snit. But, in a nice change of pace, she spewed her venom at “capitulationist” Republicans promoting “shamnesty” rather than Democrats. Even if the guest order didn’t tip you off, there was no doubt which side of the rift guest host Stuart Varney sat on. “What’s in their political interests to rush this through?” he asked. “What is hard line about enforcing the law against people who defy judicial orders?” Malkin replied. “Throwing out a half million people and rounding up some others, that’s a hard line,” Varney answered. “It is not a hard line because there used to be bi-partisan agreement that this was a national security threat,” she countered. Meanwhile, the Obama administration has seriously tightened the border. Attempts to cross the border illegally are down 80% from peak, and seizures of illegal drugs, weapons, and other contraband are up. But nobody mentioned that. Also not mentioned? As the Christian Science Monitor reported, "The United States deported more than 400,000 illegal immigrants in 2012, the most of any year in the nation’s history, US Immigration and Customs Enforcement (ICE) reports." Nobody mentioned that, either. Appearing on Fox News this afternoon, conservative columnist Michelle Malkin went off on the Republican "Gang of Eight" and "open borders" Democrats for abandoning what she believes was a bipartisan post-9/11 belief that illegal immigration represented a "national security threat." OK, I give up — anybody else have any idea what the hell Bill Bledsoe is ranting about? Michelle: Your self loathing is all too apparent. It won’t convince anyone that you are the blond WASP you wannabe. It does convince that you are a mean girl. 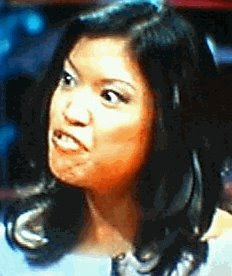 when doesn’t malkin have a hissy fit? Any bets Malkin’s level of hate is directly proportional to the intensity of the lighting she finds herself surrounded by at any given point in time? @ mj: Of course, the Filipina anchor baby didn’t stop to think. Thinking involves the highly evolved mammalian brain. I strongly doubt that Misshell’s brain has evolved beyond the brain of your typical crocodile or cobra—with the exception of emotion (after all, when a crocodile attacks a human, it’s not out of hatred—just hunger or territoriality; Misshell, on the other hand, attacks humans out of sheer hatred). And here I was, thinking Malkin had calmed down a little. Silly me. I don’t know the specifics about the other 499,999 immigrants, but I am all in favor of immediate deportation of one venomous Filipina anchor baby named Maglalang. But, in a nice change of pace, she spewed her venom at “capitulationist” Republicans promoting “shamnesty” rather than Democrats. I can’t help but wonder if, during Ms. Maglalang’s rant, she stopped to think that it was a form of “shamnesty” that allowed HER PARENTS to have her in Philadelphia instead of the Philippine Islands? It's a GOP Civil War on Fox again!